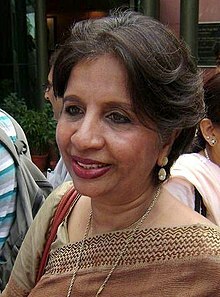 Nirupama Menon Rao (born 6 December 1950) is a retired 1973 batch Indian Foreign Service officer, who served as India's Foreign Secretary from 2009 to 2011, as well as being India's Ambassador to the United States, China and Sri Lanka (High Commissioner) during her career. In July 2009, she became the second woman (after Chokila Iyer) to hold the post of India's Foreign Secretary, the head of the Indian Foreign Service. In her career she served in several capacities including, Minister of Press, Information and Culture in Washington DC, Deputy Chief of Mission in Moscow, stints in the MEA as Joint Secretary, East Asia and External Publicity, the latter position making her the first woman spokesperson of the MEA, Chief of Personnel, Ambassador to Peru and China, and High Commissioner to Sri Lanka. Nirupama Rao was born in Malappuram, Kerala. Her father, Lt. Colonel P.V.N Menon, was in the Indian Army. Her mother, Meempat Narayanikutty, was the first woman college graduate in her family, obtaining a BA Mathematics (Honors) degree from Madras University in 1947. Her sisters, Nirmala and Asha, are medical doctors by profession. Nirmala, pursued a career in the Indian Navy, retiring in 2013 as Surgeon Rear Admiral. Due to her father's profession, Rao schooled in various cities including Bangalore, Pune, Lucknow, and Coonoor. She graduated from Mount Carmel College, Bangalore, with a BA in English in 1970, topping the Bangalore University. She was a member of the then Mysore government's youth delegation to Expo 70 in Japan, in September 1970. She then went on to obtain her master's degree in English Literature from what was then known as Marathwada University in Maharashtra. In 1973, Rao topped the All India Civil Services Examination for both the Indian Foreign Service and the Indian Administrative Service, and joined the Indian Foreign Service. On completion of her training at the Lal Bahadur Shastri National Academy of Administration in Musoorie, she served in the Indian Embassy in Vienna, Austria from 1976 to 1977, where she completed her German language training at the University of Vienna. From 1978 to 1981, Rao served as an Under Secretary on the Southern Africa and Nepal desks, respectively, in the Ministry of External Affairs (MEA) in New Delhi. In 1981, Rao was posted as First Secretary in the Indian High Commission in Sri Lanka. Here, she witnessed first hand the devastating ethnic riots of July 1983, which marked the beginning of the Sri Lankan Civil War. After returning to Delhi, Rao specialized in India's relations with China. She served in the MEA's East Asia Division for an unprecedented 8 consecutive years, from 1984 to 1992, eventually becoming Joint Secretary of the division in the late 1980s. In this period, Rao became an expert on the Sino-Indian border dispute and was seen as a key player in the revitalization of Sino-Indian ties. She was a member of the delegation led by Prime Minister Rajiv Gandhi when he made his historic visit to Beijing in December 1988. Her interest in Tibetan affairs was consolidated with visits to the Tibet Autonomous Region, including the leading of a group of Indian pilgrims to the holy sites of Mt. Kailash and Lake Mansarovar in August 1986 and a visit to Lhasa and Xigaze in the summer of 1992. Rao was a Fellow at the Weatherhead Center for International Affairs at Harvard University in 1992-93 where she specialized on Asia-Pacific Security. Her paper on the subject, won the 1994 Bimal Sanyal Prize for the best dissertation written by an IFS officer. Following her stint at Harvard, Rao served as Minister for Press, Information and Culture at the Indian Embassy in Washington D.C. from 1993 to 1995. Rao's first Ambassadorship was to Peru with concurrent accreditation to Bolivia, serving from 1995 to 1998. Her tenure saw the first ever visit by a sitting Indian President to Peru, when K.R. Narayanan visited in April/May 1998. This followed Peruvian President Alberto Fujimori's visit to India in May 1997, the last such visit by a Peruvian Head of State. On that visit several agreements of mutual cooperation and two business agreements between the countries were signed. Rao was present at the Japanese embassy in Lima on December 17, 1996, during a reception to celebrate the birthday of the Japanese Emperor. She left the embassy minutes before it was stormed by a group of Tupac Amaru militants who occupied the embassy for the next four months, holding a number of high-profile hostages. After her tenure in Peru, Rao served as Deputy Chief of Mission at the Indian Embassy in Moscow from 1998 to 1999. Following this posting, she returned to the United States as a Distinguished International Executive in Residence at the University of Maryland at College Park from 1999 to 2000. In 2001, Rao became the official spokesperson for the MEA with her appointment as Joint Secretary, External Publicity Division (XP). Rao was the first, and so far only, female spokesperson for the MEA. Rao's tenure as spokesperson coincided with several significant events, including the July 2001 Agra Summit between India and Pakistan, and the December 2001 attack on the Indian Parliament and the subsequent standoff between India and Pakistan. This was a period during which the spokesperson's office gave frequent live briefings for the electronic and print media, both national and international and also began to post the complete transcripts of briefings on the website of the MEA, a practice that has since become institutionalized. From 2002 to 2004, Rao served as Additional Secretary, Administration (MEA Chief of Personnel). During this period she was also Foreign Service Inspector. In 2003, on the initiative of the then National Security Advisor and Principal Secretary to the Prime Minister, Brajesh Mishra, Rao became a member of the Special Representative's delegation for border talks with China. She participated in the first three rounds of these talks before her departure for Sri Lanka in 2004. Rao became India's first woman High Commissioner to Sri Lanka in August 2004, replacing Nirupam Sen. Her tenure in Sri Lanka saw the devastating tsunami of December 2004 with Rao overseeing and administering the relief operations launched by India for the affected areas of Sri Lanka, including the war torn North and East of the country where she visited Jaffna, Batticaloa and other towns including relief camps. (The Indian Army, Navy and Air Force were extensively involved in the relief operations; they were returning to the island nation for the first time after the withdrawal of the Indian Peace Keeping Force (IPKF) in 1990. The Indian Army's restoration of transportation links in Arugam Bay after the deployment of five Bailey Bridges is particularly remembered. The operations by the Indian Navy to clear the Galle and Colombo harbors after the tsunami won special praise from the Sri Lankan government. The Indian government's relief efforts as first responder after the tsunami were widely praised in Sri Lanka for their promptness, efficacy and reach. During this period, Rao was also witness to significant internal political developments in Sri Lanka, including the assassination of Foreign Minister Lakshman Kadirgamar (Rao was the last foreigner to see Kadirgamar before his assassination) and the election of Mahinda Rajapaksa as President of the country. In 2006, she became India's first woman Ambassador to China. Her tenure saw state visits by President Hu Jintao to India and Prime Minister Manmohan Singh to China. The Indian Consulate General in Guangzhou was opened during her tenure in October 2007 by the then External Affairs Minister, Pranab Mukherjee. In 2007, Rao took the initiative to expand the Cultural Wing of the Embassy of India, transforming it into a hub for cultural activities including lectures, seminars, music and dance recitals and classes for Chinese students interested in Indian culture. The India-China Business Forum was also set up during this time, enabling a sharper focus on business-related activities concerning trade and investment between India and China. In 2009, at Rao's initiative, India sponsored a farmers’ training and information center in the far western province of Ningxia, a low income area. This was a first in the history of India-China relations. The construction of an Indian-style Buddhist temple at the ancient town of Luoyang in central China proceeded with rapidity during this period. Rao's tenure also witnessed the devastating Sichuan earthquake in the summer of 2008, on the eve of the Beijing Olympics. Following this, the Indian government announced relief worth 5 million U.S. dollars for the victims. Rao visited the earthquake affected city of Chengdu soon after the earthquake to coincide with the arrival of Indian Air Force aircraft bringing relief supplies. Rao's being summoned to the Chinese Ministry of Foreign Affairs at the early hour of 2 a.m on 21 March 2008 during disturbances in Tibet was the subject of considerable focus and criticism in the Indian media. Rao became India's second woman Foreign Secretary, succeeding Shivshankar Menon, on 1 August 2009. On 21 December 2010, the Government of India approved the extension of Rao's tenure as India's Foreign Secretary until 31 July 2011. The two-year tenure for Indian Foreign Secretaries was instituted during Rao's term of office as Foreign Secretary. During her tenure Rao was active in handling India's relations with its neighbors and with the United States, Russia and Japan, besides multilateral issues including nuclear energy cooperation as well as climate change. In this period, India was elected to a two-year term as non-permanent member of the United Nations Security Council. Rao's handling of India-Pakistan related issues received considerable attention in the media. She was also instrumental in the setting up of the Indian Consulates General in Jaffna and Hambantota in Sri Lanka, with External Affairs Minister S.M. Krishna publicly commending her for her role in the process. Rao also steered two Conferences of Indian Heads of Mission during her tenure. Rao made special efforts to augment and intensify the activities of the Public Diplomacy Division of the Ministry of External Affairs increasing its outreach significantly. She was a pioneer among senior officers of the Government of India in the use of social media, establishing her Twitter account in February 2011. During the evacuation of Indians at the time of the Libyan crisis Rao was commended for using her Twitter account (https://twitter.com/NMenonRao) to regularly update the public about the evacuation and also to respond to requests for help from stranded Indians in Libya. As of August 2016, she has over 800,000 followers on Twitter. In 2010, while she was Foreign Secretary, Rao delivered the Harish Mahindra lecture at Harvard University and in 2011, the inaugural lecture for the Singapore Consortium for India-China Dialogue. She also received the KPS Menon Award in 2010 and also the Sree Chithira Thirunal Award in 2011. She was appointed as Ambassador of India to the US after completion of her tenure as Foreign Secretary. She served a tenure as ambassador in the United States from September 2011 to November 2013. Secretary Clinton Meets With Indian Ambassador Rao, in 2012. Rao played a strong advocacy role for the bilateral relationship, being active in several public fora, including many leading U.S. universities, radio and TV shows, and in the print media where she authored op-eds on gender issues in India, IPR issues concerning pharmaceuticals, and on the growth of the India-U.S. strategic partnership. She interacted frequently with several Indian American community organizations across the length and breadth of the United States. She was particularly active in her outreach  to the members of the Senate and House Caucuses on India and Indian Americans in both Houses of the U.S. Congress. This period also saw the visit of Prime Minister Manmohan Singh to Washington in September 2013, two meetings of the India-U.S. Strategic Dialogue, and several ministerial-level interactions between the two countries. One of her specific mission goals was to see the actualization of a long-standing goal for India to acquire a property for housing an Indian Cultural Center in Washington. Her tenure saw the purchase by the Indian Government (ending a quest that had lasted for close to four decades) of a property in downtown Washington D.C. to house the Center. Rao had consistently held that the fascination in the United States for Indian culture, the arts and letters of India, music and dance could be effectively leveraged to secure a deeper understanding and partnership. During her term, the Indian Embassy residence in Washington became a hub of several high-profile cultural events drawing the elite of the city to the Embassy and thereby significantly enhancing India's outreach in the city. Her efforts also led to the inscribing of the Embassy residence in the register of historical (heritage) residences in the upscale Cleveland Park neighborhood of the city. She has written a book of poetry, named Rain Rising. Her poems have been translated into Chinese and Russian. A Malayalam translation of her book "Rain Rising" was released by Calicut University in June 2013. On the completion of her tenure as Ambassador of India to the United States in November 2013, Brown University announced that Nirupama Rao would be the Meera and Vikram Gandhi Fellow in residence at the University during 2014. During the year, Rao was engaged in research and writing on select foreign policy issues during this period. She has since completed her fellowship at Brown University. She has led a seminar course on "India in the World" at Brown University in 2015. The course covers several key areas of India's foreign policy and global interaction. In November 2014, the Jawaharlal Nehru Memorial Fund, New Delhi announced the conferment of the prestigious Jawaharlal Nehru Fellowship on Nirupama Rao in connection with her book project (currently in writing) entitled "The Politics of History: India and China, 1949 to 1962". The book will be a diplomatic/political history of the relations between India and China in the crucial decade leading to the brief border-related conflict of 1962. In retirement, Rao has been active on the lecture circuit in several universities and institutions of higher learning. Ambassador Rao was conferred the degree of Doctor of Letters (Honoris Causa) by the Pondicherry University at their Convocation in May 2012. She has also been named (2012) to the global list of the One Hundred Most Influential Women on Twitter by ForeignPolicy.com. In February 2016, Rao received the Vanitha Rathnam Award from the Government of Kerala. ^ Nirupama Rao takes over as Foreign Secy Press Trust of India / New Delhi, Business Standard, 1 August 2009. ^ a b Nirupama Rao is India's new foreign secretary The Times of India, 1 August 2009. "Chokila Iyer was first woman, Indian Foreign Secretary in 2001." ^ "Nirupama Rao To Replace Menon As Foreign Secretary". The Economic Times. ET Bureau. 1 July 2009. ^ "Ex-Foreign Secretary Visits Bamu". The Times of India. Times News Network. 24 June 2016. ^ Matt Bewig (2 November 2011). "Ambassador From India: Who Is Nirupama Rao". All Gov. ^ V.S. Sambandan (18 September 2004). "Nirupama Rao presents credentials to Chandrika". The Hindu. ^ a b C. Raja Mohan (13 June 2001). "Nirupama Rao Takes Over". The Hindu. ^ "Nirupama Rao awarded Jawaharlal Nehru Fellowship". The Economic Times. PTI. 12 November 2014. ^ Ilica Malkanthi Karunaratnetne. "Personality of the Week: Nirupama Menon Rao". The Island. ^ "Fellows Program". Weather Center for International Affairs Harvard University. ^ "USINPAC congratulates Nirupama Rao on becoming the new Indian Ambassador to the US". USINPAC. 2 August 2011. ^ "India – Peru Bilateral Relations". Embassy of Peru in India. ^ a b K.P. Nayar (2 August 2009). "New Foreign Secretary Only Woman to Tour Entire Border with China". The Telegraph (India). ^ "Nirupama Rao Set to be Next Foreign Secretary". The New Indian Express. IANS. 30 June 2009. ^ Rao, Nirupama (19 February 2005). "A Tsunami Diary". The Hindu. ^ Palakidnar, Ananth (20 March 2005). "India's goodwill gesture: Bridge on the Arugambay". Sunday Observer. ^ Dikshit, Sandeep (14 January 2005). "Navy's prowess draws praise". The Hindu. ^ Datta, Saikat (31 January 2005). "In Aid of Strategy". Outlook. ^ "Consulate". Consulate General of India Guangzhou. ^ "India-China Cultural Relations". indianembassy.org.cn. ^ "India's Foreign Relations - 2009 Documents" (PDF). mea.gov.in. ^ "India Begins Poverty Alleviation Project in China". China Digital Times. 21 June 2009. ^ "Arrival of first Indian flight with relief supplies for earthquake victims in Chengdu, China". mea.gov.in. 17 May 2008. ^ Baruah, Amit (4 April 2008). "China did not 'summon' envoy". Hindustan Times. ^ "Nirupama Gets Seven-Month Extension". Outlook. 1 December 2010. ^ Thottam, Jyoti (25 February 2010). "India-Pakistan Talks: Is a Breakthrough Possible?". Time. ^ "India Seeks to Open Consulate in Jaffna". DNA India. PTI. 8 March 2010. ^ R. Vasudevan (10 June 2010). "Foreign Secretary Nirupama Rao's Briefing on President Rajapaksa Visit". Asian Tribune. ^ T.V. Sriram (28 November 2010). "Krishna inaugurates Indian missions in Jaffna and Hambantota". Rediff. ^ "Foreign policy, domestic priorities intertwined, says Nirupama Rao". The Hindu. 28 August 2010. ^ "Nirupama Stress Importance of Public Diplomacy in International Relations". Sify.com. 10 December 2010. ^ "Now, Nirupama Rao on Twitter". The New Indian Express. IANS. 12 February 2011. ^ Prakash, Smita (4 March 2011). "Indian diplomacy's new age avatar". rediff.com. ^ "New star of Twitter, Nirupama Rao". Hindustan Times. IANS. 2 March 2011. ^ "Nirupama Rao Delivers Lecture at Harvard University". India Infoline. 21 September 2010. ^ "Inaugural Lecture of the Singapore Consortium for India-China Dialogue" (PDF). National University of Singapore. 13 January 2011. ^ "K.P.S Menon Memorial Award to be Presented to Nirupama Rao on Monday". The Hindu. 26 December 2010. ^ "Sree Chitra Tirunal Award for Nirupama Rao". Outlook. 3 August 2011. ^ Wax, Emily (27 October 2011). "Ambassador Nirupama Rao, India's new woman in Washington". The Washington Post. ISSN 0190-8286. ^ "Ambassador Rao Visits Orange County, CA At The Invitation Of HFAC Chairman Ed Royce". The Indian Panorama. ^ "Indian Ambassador to U.S. bids farewell". The Hindu. 1 November 2013. ISSN 0971-751X. ^ a b Aziz Haniffa (5 November 2013). "Obama administration bids sentimental adieu to Nirupama Rao". Rediff. ^ Narayan Lakshman (1 November 2013). "Indian Ambassador to U.S. Bids Farewell". The Hindu. ^ "Ambassador's Blog on the Visit of Cleveland Park Historical Society to Embassy Residence". Embassy of India, Washington D.C., U.S.A. 6 May 2012. ^ "Ambassador Rao named Gandhi visiting fellow". Brown University. 18 November 2013. ^ "Nirupama Rao Awarded the Jawaharlal Nehru Fellowship". Outlook. 12 November 2014. ^ "Awards for Diplomat, Former CJ". News 18. 16 May 2012. ^ Jillian C. York (20 June 2012). "Introducing the FPwomerati". Foreign Policy. ^ "Vanitha Rathnam Award". Calicut New Media. 29 February 2016. Wikimedia Commons has media related to Nirupama Rao. India Ambassador, Official page at Embassy of India, Washington, D.C. This page was last edited on 7 March 2019, at 16:46 (UTC).